With the museum opening for another season the article above featured in a recent edition of the Courier. We will be open to the public at Easter 2018. Meanwhile groups of any size are welcome to arrange a visit by using the contact form on this website. 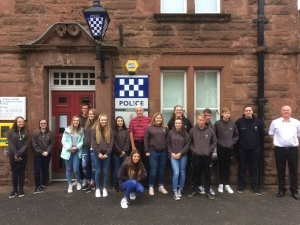 On both 1st and 15th June 2017, Arbroath’s Police Scotland Youth Volunteers visited the Tayside Police Museum in Kirriemuir as part of their continuing commitment to understanding Policing in their local area. During their visit, PSYV Arbroath were guided through the decades by retired officers Hamish Gray and George Morgan who between them have over 60 years of Policing experience in the local area. The Youth Volunteers had a great time learning about the history of Policing in their area and were surprised to find that the origins of Policing in their own town of Arbroath were first established as far back as 1836. Delving further back in time, they also found out that Policing in Perth can be traced back to 1811, 18 years before Sir Robert Peel established the ‘Bow Street Runners’ in London. Many of the artefacts caught the attention of the Youth Volunteers, particularly the birching bench which was used during the whipping of young male offenders in days gone by!! The team also got to meet two permanent residents of the museum, namely Oor Wullie and PC Murdoch who didn’t appear too impressed with Youth Volunteer Sam’s new uniform. A huge ‘Thank You’ to Hamish and George for taking the time to speak to PSYV Arbroath about the museum and its heritage. We recently received a visit from a party from the Arbroath Trefoil Guild. Subsequently the following item appeared in the local paper, the Arbroath Herald. The March meeting of the Arbroath Trefoil Guild was an afternoon with a difference. Members met at the Forfar Driving Range coffee shop where a light lunch was enjoyed before continuing to Kirriemuir where a guided tour of the Tayside Police Museum had been arranged. 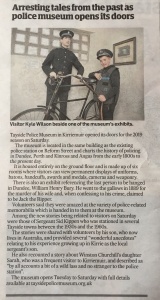 The museum is located on the ground floor of Kirriemuir Police Station and boasts a very comprehensive exhibition of all aspects of policing from the early 1800s through to the 1980s in Dundee City, Perth & Kinross, and Angus. The museum is run by volunteers and our two guides were fantastic, making the visit even more interesting and most enjoyable. Although it was extremely windy it was a lovely day for the drive both there and back – the countryside looked beautiful with new growth and newly ploughed fields – also some lovely views over the County. Our next meeting is on 11th April in Arbroath Girlguiding HQ at 2 o’clock when there will be a speaker from Project Linus UK. It was very gratifying to hear how much they had enjoyed their day out and how our volunteers had made their visit even more interesting and enjoyable. The Museum will open again on Friday 14th April 2017. 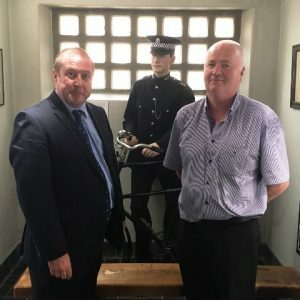 A considerable variety of people have visited the Museum since the opening, including a seven year old who was completely enthralled by the experience, historians and especially retired police officers. The volunteers who man the Museum on a daily basis are mostly retired police officers and so visits from former colleagues work both ways as the visitors are often able to provide more background information but also enjoy the mutual banter. A recent post to Twitter highlighted the possibilities of a visit to the Museum as part of a Modern Studies course.